Trajectory matches most target loads to 50 yards. Large HP cavity for reliable expansion at sub-sonic velocity without fragmentation. 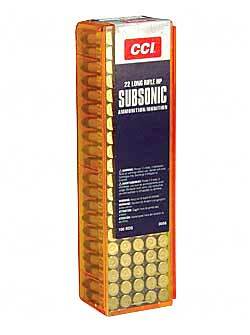 Quieter than high-speed 22 LR hollow point loads. Clean-burning propellants keep actions cleaner. Sure-fire CCI priming. Reusable plastic box with dispenser lid. Muzzle velocity 1050 feet per second.